He said government has implemented various initiatives including legislation aimed at reducing violent crimes. The number of illegal guns seized, is evidence of these initiatives, he said. The AG claimed gun seizures have increased during the current People’s National Movement (PNM) administration. “If you look at the number of firearms seized across all nine divisions, we found 761 in 2016, you will note 691 seized in 2015. “But when you look at the figures going backwards, the total number of firearms – under our watch – we have doubled the seizure,” he said. “We are confident the forces are moving strong. But we must add a little bit extra and the anti-gang law is one of those things (that can help),” Al-Rawi noted. He added that the increasing murder rate is a sobering reminder to the Opposition of the need to implement new anti-gang legislation. “When we were in opposition, we agreed that the anti-gang law was good enough for the country. Al-Rawi is expected to debate the anti-gang act in Parliament tomorrow. While AG Al-Rawi was assuring the nation that government was in control, the Opposition United National Congress (UNC) was saying otherwise. Pointe-a-Pierre MP and UNC deputy political leader David Lee said this government is not doing anything on the ground level to treat with crime. “We have always said this government does not have a plan for crime. We have had 16 murders in the past four days and there has been no response from this government. “What the AG will tell you is that he is bringing anti-gang legislation, but that alone will not bring down the murders because not enough is being done at ground level,” Lee said. He called for solutions especially with Christmas and Carnival coming up. “We are not seeing anything from this government to assure that we the citizens will be safe,” Lee said. The first four days of this month, saw 16 murders being committed. On Friday December 1, six people were killed. On Saturday December 2, three were murdered; on Sunday December 3, five more murders were committed and yesterday, December 4, two murders were committed. Akeil Edwards, 21, and Shem Legall were, up to press time, the nation’s latest murder victims. 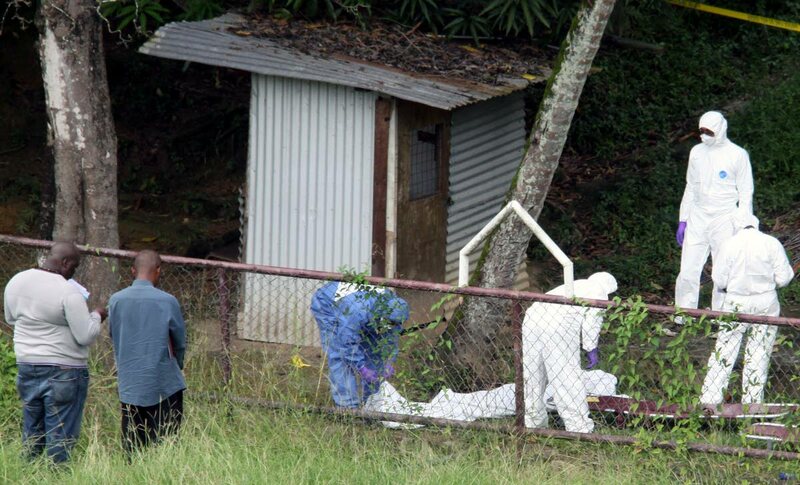 Police said that at about 8.10 pm on Sunday, Morvant residents heard gunshots but no-one made any checks to see what was going on since gunshots are a common occurrence in that area. At 6 am yesterday, their bodies were found in a drain near a playing field at Pelican Extension. Edwards’ mother Shelly-Ann Alexis, stood nearby and watched policemen process the scene around his body. She was consoled by other relatives and friends. She said her son was respectful and loving but wayward. The last time she heard from him was three months ago. He moved out of the family’s Lady Young Avenue, Morvant home two years ago. Another shooting led to another double murder on Sunday night, where Jamal Modeste, and Mukhtar Ali were both killed. At about 9 pm, residents of Barton Lane heard gunshots and alerted the police. When police checked, they found Modeste and Ali on the ground bleeding from gunshot wounds. As he cried out for justice yesterday, Ali’s father Dawood Ali urged parents and guardians to educate their children and not allow them to get carried away by a selfish and materialistic society. Speaking outside the Forensic Science Centre in St James, Ali said his son’s murder left him deeply pained and added he did not know why anyone would want Ali dead. He called on youngsters to pay closer attention to their friends. ACP (Crime) Irwin Hackshaw yesterday said the police are doing everything they can to stem the tide of murders. “We are very disturbed about the current state when it comes to murders in this country. We are putting all our efforts into play and pushing on to ensure that the rest of the year is safe for law abiding citizens. In the meantime we are advising that people be vigilant and look after their safety and security at all times. Pay attention to where you go, report any and all suspicious activity to the police and allow them to do their jobs” Hackshaw said. Anderson Babwah, 22, of Marabella, stabbed to death. Reply to "16 murders in 4 days, Al-Rawi assures GOVT IN CONTROL"